Elkhorn (AOG-7) was launched 15 May 1943 by Cargill Inc. Savage Minn.; sponsored by Mrs. J. A. Flynn and commissioned 12 February 1944 Lieutenant (junior grade) T. A. Norris USNR in command. Elkhorn sailed from New Orleans 25 February 1944 for the South Pacific and arrived at Milne Bay New Guinea 29 May for duty as station tanker. She made several voyages to Manus to reload and fueled ships in the invasion of Morotai in September 1944 otherwise serving at Milne Bay until March 1945 when she arrived at Leyte. Elkhorn served throughout the Philippines until 1 December then returned to the west coast for overhaul. 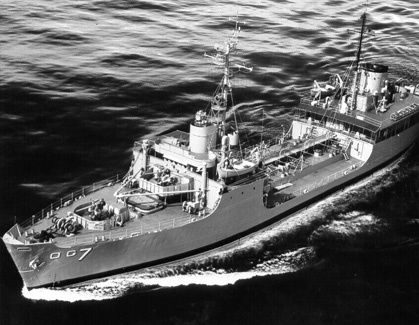 Elkhorn remained on active service with the Pacific Fleet through 1962. From her base at Pearl Harbor she alternated tours of duty in the Far East with cruises among the islands of the South and central Pacific. During the Korean war she operated in Japanese waters and off the Korean coast twice in 1951 and 1953 and in 1956 and 1957 she sailed from the west coast to Icy Cape and Point Barrow as a part of the Arctic resupply missions.